Mississippi River from Cairo Illinois to St. Mary’s Missouri in VI Sheets. Reconnaissance for the use of the Mississippi Squadron under the command of Acting Rear Admiral S.P.L.E.E, U.S.N. By the part of E. H. Gerdes, Assistant; assigned by A.D. Bache, Supdt. United States Coast Survey. 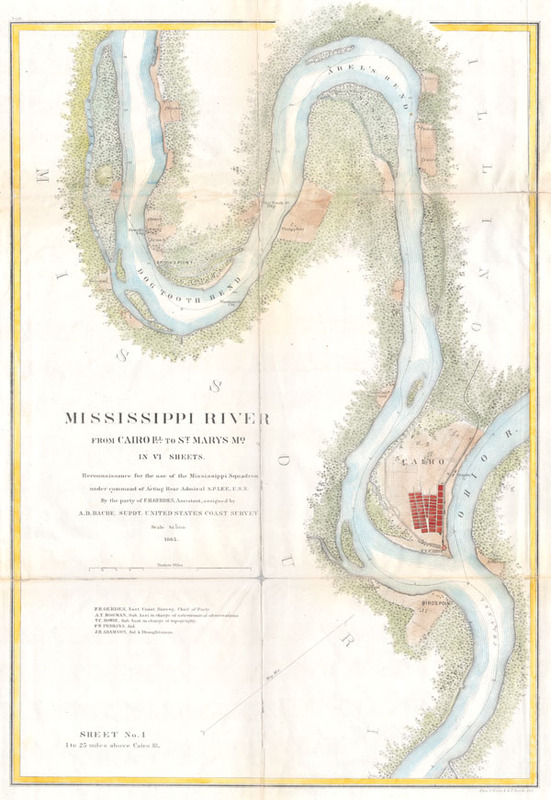 This is a beautiful 1865 United States Costal Survey chart or map of a sinuous part of the Mississippi River around Cairo, Illinois near the branching off of the Ohio River. Sheet one of a six sheet set depicting the Mississippi River from Cairo Illinois to St. Mary's Missouri. The bends in the river are named, as are the many river islands shown. Notes towns, wood lots, landings and farms, many of which are shown with family names. This map was created under the direction of A. D. Bache, Superintendent of the Survey of the Coast of the United States and one of the most influential American cartographers of the 19th century. Good condition. Some discoloration and verso repairs along original folds, especially at the fold intersections. Can be beautifully framed and displayed.